Love, Honor, and Obey (1 John 4:17–5:5) | Joe Quatrone, Jr.
Posted on May 15, 2014	by Pastor Joe Quatrone, Jr. This is the truth in view in this portion of 1 John. Up to this point the emphasis has been on Christians loving one another, but now we turn to a deeper—and more important—topic: a believer’s love for the Father. We cannot love our neighbor or our brother unless we love our heavenly Father. We must first love God with all our hearts; then we can love our neighbor as ourselves. The key word in this section is perfect. God wants to perfect in us His love for us and our love for Him. The word perfect carries the idea of maturity and completeness. A believer is not only to grow in grace and knowledge (2 Pet. 3:18), but he is also to grow in his love for the Father. He does this in response to the Father’s love for him. How much does God love us? Enough to send His Son to die for us (Jn. 3:16). He loves His children in the same way as He loves Christ (Jn. 17:23). And Jesus tells us the Father wants the love with which He loved the Son to be in His children (Jn. 17:26). In other words, the Christian life is to be a daily experience of growing in the love of God. It involves a Christian’s coming to know his heavenly Father in a much deeper way as he grows in love. It is easy to fragment the Christian life and become preoccupied with individual pieces instead of the total picture. One group may emphasize “holiness” and urge its members to get victory over sin. Another may stress witnessing or “separation from the world.” But each of these emphases is really a by-product of something else: a believer’s growing love for the Father. Mature Christian love is the great universal need among God’s people. How can a believer know his love for the Father is being perfected? 1 John 4:17–5:5 gives four evidences. Two brand-new words come into John’s vocabulary here: fear and torment. And this is written to believers! It is possible that Christians can actually live in fear and torment. Unfortunately, many professed believers experience both fear and torment day after day. And the reason is because they are not growing in the love of God! The word boldness can mean “confidence” or “freedom of speech.” It does not mean brazenness or brashness. A believer who experiences perfecting love grows in his confidence toward God. He has a reverential fear of God, not a tormenting fear. He is a son who respects his Father, not a prisoner who cringes before a judge. We have adopted the Greek word for fear into our English vocabulary: phobia. All sorts of phobias are listed in psychology books; for instance, acrophobia—“fear of heights” and hydrophobia—“fear of water.” John is writing about krisisphobia—“fear of judgment.” John has already mentioned this solemn truth in 1 John 2:28 and now he deals with it again. If people are afraid, it is because of something in the past that haunts them, something in the present that upsets them, or something in the future that threatens them. Or it may be a combination of all three. A believer in Jesus Christ does not have to fear the past, present, or future because he has experienced the love of God and this love is being perfected in him day by day. “People are destined to die once and after that to face judgment” (Heb. 9:27). A Christian does not fear future judgment because Christ has suffered his judgment for him on the cross. “Therefore, there is now no condemnation for those who are in Christ Jesus” (Rom. 8:1). For a Christian, judgment is not future; it is past. His sins have been judged already at the cross and they will never be brought against him again. “Very truly I tell you, whoever hears My word and believes Him who sent Me has eternal life and will not be judged, but has crossed over from death to life” (John 5:24). The secret of our boldness is, “In this world, we are like Jesus” (1 Jn. 4:17). Positionally, we are right now “as He is.” We are so closely identified with Christ as members of His body that our position in this world is like His exalted position in heaven. This means the Father deals with us as He deals with His own beloved Son. How, then, can we ever be afraid? We do not have to be afraid of the future because our sins were judged in Christ when He died on the cross. We do not have to be afraid of the past because “He [God] first loved us.” From the very outset, our relationship to God was one of love. It was not that we loved Him, but that He loved us (1 Jn. 4:10). “For if, while we were God’s enemies, we were reconciled to Him through the death of His Son, how much more, having been reconciled, shall we be saved through His life!” (Rom. 5:10). If God loved us when we were outside the family, disobeying Him, how much more does He love us now that we are His children! We do not need to fear the present because “perfect love drives out fear” (1 Jn. 4:18). As we grow in the love of God, we cease to be fearful of what He will do. Of course, there is a proper “fear of God,” but it is not the kind of fear that produces torment. “The Spirit you received does not make you slaves, so that you live in fear again; rather, the Spirit you received brought about your adoption to sonship. And by Him we cry, ‘Abba Father ” (Rom. 8:15). “For the Spirit God gave us does not make us timid, but gives us power, love and self-discipline” (2 Tim. 1:7). Fear is actually the beginning of torment. We torment ourselves as we contemplate what lies ahead. Many people suffer acutely when they contemplate a visit to the doctor. Think of how an unsaved person must suffer as he contemplates the day of judgment. But since a Christian has boldness in the day of judgment, he can have boldness as he faces life today, for there is no situation in life today that begins to compare with the terrible severity of the day of judgment. God wants His children to live in an atmosphere of love and confidence, not fear and torment. We need not fear life or death, for we are being perfected in the love of God. “Who shall separate us from the love of Christ? Shall tribulation, or distress, or persecution, or famine, or nakedness, or peril, or sword? No, in all these things we are more than conquerors through Him who loved us. For I am convinced that neither death nor life, neither angels nor demons, neither the present nor the future, nor any powers, neither height nor depth, nor anything else in all creation, will be able to separate us from the love of God that is in Christ Jesus our Lord” (Rom. 8:35, 37–39). Imagine! Nothing in all creation—present or future—can come between us and God’s love! The perfecting of God’s love in our lives is usually a matter of several stages. When we were lost, we lived in fear and knew nothing of God’s love. After we trusted Christ, we found a perplexing mixture of both fear and love in our hearts. As we grew in fellowship with the Father, gradually the fear vanished and our hearts were controlled by His love alone. An immature Christian is tossed between fear and love; a mature Christian rests in God’s love. A growing confidence in the presence of God is one of the first evidences that our love for God is maturing. But confidence never stands alone; it always leads to other moral results. Here it is for the seventh time: “Whoever claims…!” We have met this important phrase several times in John’s letter and each time we knew what was coming: a warning against pretending. Fear and pretense usually go together. In fact, they were born together when the first man and woman sinned. No sooner did Adam and Eve sense their guilt than they tried to hide from God and cover their nakedness, but neither their coverings nor their excuses could shelter them from God’s all-seeing eye. Adam finally had to admit, “I heard You in the garden and I was afraid” (Gen. 3:10). But when our hearts are confident toward God, there is no need for us to pretend either to God or to other people. A Christian who lacks confidence with God will also lack confidence with God’s people. Part of the torment fear generates is the constant worry, “How much do others really know about me?” But when we have confidence with God, this fear is gone and we can face both God and men without worry. “How many members do you have in your church?” a visitor asked the pastor. “Somewhere near a thousand,” the pastor replied. “That certainly is a lot of people to try to please!” the visitor exclaimed. An immature Christian who is not growing in his love for God may think he has to impress others with his “spirituality.” This mistake turns him into a liar! He is professing something he is not really practicing; he is playing a role instead of living a life. Perhaps the best example of this sin is seen in the experience of Ananias and Sapphira (Acts 5). They sold a piece of property and brought part of the money to the Lord, but gave the impression they were bringing all the money. The sin of this couple was not in taking money from God, for Peter made it clear that the disposal of the money was up to them (Acts 5:4). Their sin was hypocrisy. They were trying to make people think they were more generous and spiritual than they really were. Pretending is one of the favorite activities of little children, but it is certainly not a mark of maturity in adults. Adults must know themselves and be themselves, fulfilling the purposes for which Christ saved them. Their lives must be marked by honesty. Spiritual honesty brings peace and power to the person who practices it. He does not have to keep a record of the lies he has told and he is not using his energy to cover up. Since he lives in open honesty with the Father, he can live in honesty with other people. Love and truth go together. Because he knows God loves him and accepts him (even with all his faults), he is not trying to impress others. He loves God and therefore he loves his fellow Christians. Jerry’s grades were far below his usual performance and, on top of that, his health seemed to be failing. His new roommate was concerned about him and finally persuaded him to talk to the campus psychologist. “You’re not having trouble with your new roommate, are you?” the counselor asked. Jerry did not reply right away and this gave the counselor a clue. Confidence toward God and honesty with others are two marks of maturity that are bound to show up when our love for God is being perfected. Not simply obedience—but joyful obedience! “His commandments are not burdensome” (1 Jn. 5:3). Everything in creation—except man—obeys the will of God. “Lightning and hail, snow and clouds, stormy winds that do His bidding” (Ps. 148:8). In the Book of Jonah, you see the winds, waves, and even the fish obeying God’s commands, but the prophet persisted in disobeying. Even a plant and a little worm did what God commanded, but the prophet stubbornly wanted his own way. Disobedience to God’s will is a tragedy—but so is reluctant, grudging obedience. God does not want us to disobey Him, but neither does He want us to obey out of fear or necessity. What Paul wrote about giving also applies to living: “not grudgingly or under compulsion, for God loves a cheerful giver” (2 Cor. 9:7). What is the secret of joyful obedience? It is to recognize obedience is a family matter. We are serving a loving Father and helping our brothers and sisters in Christ. We have been born of God, we love God, and we love God’s children. Therefore, we demonstrate this love by keeping His commandments. A woman visited a newspaper editor’s office, hoping to sell him some poems she had written. “What are your poems about?” the editor asked. “They’re about love!” gushed the poetess. The poem she read was filled with moons and Junes and other sticky sentiments, and it was more than the editor could take. D.L. Moody often said, “Every Bible should be bound in shoe leather.” We show our love to God, not by empty words but by willing works. We are not slaves obeying a master; we are children obeying a Father. Our sin is a family affair. But a Christian who experiences God’s perfecting love finds himself enjoying the Word of God and truly loving it. He does not read the Bible as a textbook, but as a love letter. The longest chapter in the Bible is Psalm 119 and its theme is the Word of God. Every verse but two (vv. 122, 132) mentions the Word of God in one form or another, as “law,” “precepts,” “commandments,” etc. But the interesting thing is that the psalmist loves the Word of God and enjoys telling us about it! “Oh, how I love your law!” (v. 97). He rejoices in the Law (vv. 14, 162) and delights in it (vv. 16, 24). It is honey to his taste (v. 103). In fact, he turns God’s Law into a song: “Your statutes have been my songs in the house of my pilgrimage” (v. 54). Imagine turning statutes into songs. Suppose the local symphony presented a concert of the traffic code set to music! Most of us do not consider laws a source of joyful song, but this is the way the psalmist looked at God’s Law. Because he loved the Lord, he loved His Law. God’s commandments were not grievous and burdensome to him. Just as a loving son or daughter happily obeys his father’s command, so a Christian with perfecting love joyfully obeys God’s command. At this point, we can review and understand the practical meaning of “maturing love” in our daily lives. As our love for the Father matures, we have confidence and are no longer afraid of His will. We also are honest toward others and lose our fear of being rejected. And we have a new attitude toward the Word of God: it is the expression of God’s love and we enjoy obeying it. Confidence toward God, honesty toward others, and joyful obedience are the marks of perfecting love and the ingredients that make up a happy Christian life. We can see too how sin ruins all this. When we disobey God, we lose our confidence toward Him. If we do not immediately confess our sin and claim His forgiveness (1 Jn. 1:9), we must start pretending in order to cover up. Disobedience leads to dishonesty and both turn our hearts away from the Word of God. Instead of reading the Bible with joy to discover the Father’s will, we ignore the Word or perhaps read it in a routine way. The burden of religion (man trying to please God in his own strength) is a grievous one (Matt. 23:4), but the yoke Christ puts on us is not burdensome at all (Matt. 11:28–30). Love lightens burdens. Jacob had to work for seven years to win the woman he loved, but the Bible tells us “they seemed like only a few days to him because of his love for her” (Gen. 29:20). Perfecting love produces joyful obedience. But the Christian is “born of God.” This means he has the divine nature within him and it is impossible for this divine nature to disobey God. “For everyone born of God overcomes the world” (1 Jn. 5:4). If the old nature is in control of us, we disobey God; but if the new nature is in control, we obey God. The world appeals to the old nature (1 Jn. 2:15–17) and tries to make God’s commandments seem burdensome. Our victory is a result of faith and we grow in faith as we grow in love. The more you love someone the easier it is to trust him. The more our love for Christ is perfected the more our faith in Christ is perfected because faith and love mature together. The word overcome is a favorite with John. He uses it in 1 John 2:13–14 with reference to overcoming the devil. He uses it seven times in the Book of Revelation to describe believers and the blessings they receive (2:7, 11, 17, 26; 3:5, 12, 21). He is not describing a special class of believers. 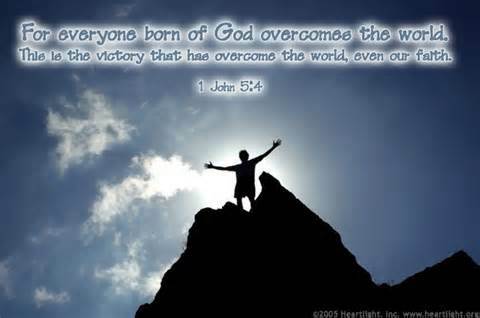 Rather, he is using the word overcomer (“victorious”) as a name for the true Christian. Because we have been born of God, we are overcomers. What is our name? “Children of God—the born-again ones of God.” Alexander the Great wanted his name to be a symbol of courage; our name carries with it assurance of victory. To be born of God means to share God’s victory. This is a victory of faith, but faith in what? Faith in Jesus Christ the Son of God! Who is it that overcomes the world? Only the one who believes Jesus is the Son of God (1 Jn. 5:5). It is not faith in ourselves, but faith in Christ that gives us the victory. “In the world you will have trouble, but be of good cheer; I have overcome the world” (Jn. 16:33). Identification with Christ in His victory reminds us of the several times we have read “as He is” in John’s letter. “As He is, so are we in this world” (1 Jn. 4:17). We should walk in the light “as He is in the light” (1 Jn. 1:7). If we claim to abide in Him, then we should conduct ourselves as He conducted Himself (1 Jn. 2:6). His children are to be, on earth, what He is in heaven. It is only necessary for us to claim this wonderful position by faith—and to act on it. When Jesus Christ died, we died with Him. Paul said, “I have been crucified with Christ” (Gal. 2:20). When Christ was buried, we were buried with Him. When He arose, we arose with Him. “We were therefore buried with Him through baptism into death in order that, just as Christ was raised from the dead through the glory of the Father, we too may live a new life” (Rom. 6:4). When Christ ascended to heaven, we ascended with Him and are now seated with Him in heavenly places (Eph. 2:6). When Christ returns, we will share His exaltation. “When Christ, who is your life, is revealed, then you also will be revealed with Him in glory” (Col. 3:4). All these verses describe our spiritual position in Christ. When we claim this position by faith, we share His victory. When God raised Jesus from the dead, He “seated Him at His right hand in the heavenly places, far above all rule and authority and power and dominion, and every name that is named … and He put all things in subjection under His feet” (Eph. 1:20–22). This means that, positionally, each child of God is privileged to sit far above all his enemies! Where a man sits determines how much authority he may exercise. The man who sits in the general manager’s chair has a restricted sphere of authority; the man who sits in the vice president’s chair exercises more control. But the man behind the desk marked president exercises the most authority. No matter where he may be in the factory or office, he is respected and obeyed because of where he sits. His power is determined by his position, not by his personal appearance or the way he feels. So with a child of God: his authority is determined by his position in Christ. When he trusted Christ, he was identified with Him by the Holy Spirit and made a member of His body (1 Cor. 12:12–13). His old life has been buried and he has been raised to a new life of glory. In Christ, he is sitting on the very throne of the universe! A Civil War veteran used to wander from place to place, begging a bed and bite to eat and always talking about his friend, “Mr. Lincoln.” Because of his injuries, he was unable to hold a steady job, but as long as he could keep going, he would chat about his beloved President. The old man replied, “Why, sure, I can prove it. In fact, I have a piece of paper here that Mr. Lincoln himself signed and gave to me.” From his old wallet the man took out a much-folded piece of paper and showed it to the man. The key, of course, is faith, but this has always been God’s key to victory. The great men and women named in Hebrews 11 all won their victories “by faith.” They simply took God at His word and acted on it, and He honored their faith and gave them victory. Faith is not simply saying what God says is true. True faith is acting on what God says because it is true. Someone has said that faith is not so much believing in spite of evidence, but obeying in spite of consequence. Victorious faith is the result of maturing love. The better we come to know and love Jesus Christ the easier it is to trust Him with the needs and battles of life. It is important that this maturing love become a regular and practical thing in our daily lives. First, we must cultivate friendship with Christ. Abraham was “God’s friend” (Jas. 2:23) because he separated himself from the world and did what God told him. His life was not perfect, but when he sinned, he confessed and went right back to walking with God. Second, this friendship will begin to influence our lives. As we read the Word, pray, and fellowship with God’s people, Christian graces will start to show up in us. Our thoughts will be cleaner, our conversation more meaningful, and our desires more wholesome. But we will not be suddenly and totally changed; it will be a gradual process. Third, our friendship with Christ and our becoming like Him will lead to a deeper love for Christ. On the human level, friendship often leads to love. On the divine level, friendship with Christ must to lead to love. “We love Him because He first loved us” (1 Jn. 4:19). The Word of God reveals His love to us, and the indwelling Spirit of God makes this love more and more real to us. This love is worked out in our lives in daily obedience. Christian love is not a passing emotion; it is a permanent devotion, a deep desire to please Christ and to do His will. Finally, the more we know Him the better we love Him, and the better we love Him the more we become like Him—“conformed to the image of His Son” (Rom. 8:29). Of course, we will not be completely conformed to Christ until we see Him (1 Jn. 3:1–3), but we begin the process now. What an exciting way to live! As God’s love is perfected in us, we have confidence toward Him and do not live in fear. Because fear is cast out, we can be honest and open; there is no need to pretend and our obedience to His commands is born out of love, not terror. We discover His commandments are not burdensome. Finally, living in this atmosphere of love, honesty, and joyful obedience, we are able to face the world with victorious faith and to overcome instead of being overcome. The place to begin is not in some daring, dramatic experience. The place to begin is in the quiet, personal place of prayer. Peter wanted to give his life for Jesus, but when he was asked to pray, Peter went to sleep (Lk. 22:31–33, 39–46). A believer who spends time reading the Word, meditating on it, and worshiping Christ in prayer and praise will experience this perfecting love. When it begins, he will know it—and others will know it. His life will be marked by confidence, honesty, joyful obedience, and victory! About Pastor Joe Quatrone, Jr.
Pastor Joe has been serving in Christian ministry for 19 years. He is the author of "Back to the Basics: A Guide for Christian Living." Through a commitment to servant leadership, he proclaims relevant Bible truth, equips the saints for effective ministry, and builds up the body of Christ. Married thirteen years, Pastor Joe and his wife live in New Jersey and have two children. This entry was posted in Book of 1 John and tagged Bible, Children of God, Faith, Joy, Love, Maturity, Obediece, Overcome, Victory. Bookmark the permalink. Reblogged this on Sam Wanders. This is a wonderful lesson. I cannot hear it enough. Mother’s day, my daughter and I went to the Mall together to get a pedicure. It is a day we spend together, a tradition. When we were done we met up with her husband and my grand children. Then in the car on the way home, she said something about the house where she grew up. I said something not so nice about not having the help I needed from her father, and then, she said, “you and dad did a good job” and in spite, I said, no, I did a good job. When I got home, I regretting that statement. It didn’t matter if it were true or not, what mattered was what I said. I apologized to her and said, she was right, and I was just being spiteful..and to tell her dad when she talked to him, “thank you for the Happy Mother’s Day greeting.” The Lord is working in me and I can’t even imagine going back to the old ways, the days of fear, that leads to sorrow and hurt. God has a plan for each of us in His will. He is who we turn to for help and he will lead us on our journey, BECAUSE HE LOVES US, We just have to let him, and trust him 100%.. and walk with our heads high and our hearts open to do His word and help those who need us. Through Him, all things are possible. I never forget that, and reading the Bible is a reminder of His word and How great the Father is to His children. Absolutely Rita! Thanks for sharing. God bless! Outstanding truth. Thanks for writing this. Wow what a powerful message Pastor Joe, I just kept rejoicing as I read that your heart was so open, that your eyes could see so clearly and your ears could hear God’s Truth without the blockages that fleshy life sometimes brings. Yes it is very True, we sit, we crawl, we toddle, we walk and than we run and as we do all of theses, we sit at Jesus feet allowing Him to teach us, to guide us, He covers us with His righteousness untill we too walk fully in His righteousness and yes He set us free so we can and we never walk alone. Have you had the Joy Pastor Joe of seeing the Song of Songs with Spiritual eyes, Wow what passion, what overflowing emotion, yes Roses and moonlight, but practical too, Love in all of it’s facets reflecting all sides like a diamond does. Some say God created roses just for the bees, their beauty and aroma for pollination to make honey but His creation is also for us to enjoy and to savior His Awesome aroma. Perhaps being a woman, I passionately appreciate the Beauty that we see all around us in God’s Creation , although to be honest once I didn’t but I do now, it was like I had blinkers on. But I find mostly men are more practical, fitting the loose ends together, they are able to reason logically without letting feelings and emotion interfere, yes they are well suited to be in Authority and to be Leaders but they also need a woman to balance their strength and for them to be able to show compassion and tenderness freely in their emotions, it is in giving we receive, like an Artist does when their heart is touched and they just have to express it on canvas or in a poem or with a song and God does this too. God gave us our emotions, all of them, it is in how we express them and why we do that determines whether they become good or evil, the same as what we do about them. There is a time for everything including to hate, yes we are indeed to hate evil when we do we reject it, we don’t welcome it. Jesus was known as a man of sorrows acquainted with grief, He knew the hearts of those who would reject Him and so perish Eternally, meaning to be forever separated from God’s Love and it grieved Him greatly. He also felt deeply for others grief and cried with them. He became righteously angry, He corrected, He warned, He rebuked, He even accepted perfumed tear stained feet dried with the flowing hair of a prostitute and He washed the feet of others, He did all theses and more because He Loved deeply and because He did He showed it, and yes as you shared Pastor Joe He did so willingly, yes it meant He was crucified too and this was also for Love, He did it all for us and we too sacrificially Love others in The Body of Christ and those in our hurting world and yes even our enemies it may even mean washing the mud off their feet. I still feel the Godly Love in your comment Pastor Joe that you left on my Blog yesterday, it was like receiving a bunch of beautiful roses which I thanked God for too. Ron does not show much emotion he keeps his feelings mostly hidden, to him a gift is something practical but one day he picked flowers for me from the garden, Wow! they were so beautiful but even more so because he gave them to me. I wonder if you would mind Pastor Joe if I gave you a link to a Power point that I originally adapted from one I received but now it has a Christian focus. I share it mostly with my girlfriends but I’m sure you too will appreciate that in it is the beauty of a rose and especially God’s aroma in them. I found it easier to read when clicked on because it was created it in a different program than the one used but yours may be OK. I would like to share Pastor Joe’s message with you so you can stop and smell the Roses, although it has a practical focus on Love it also has the sweet smelling Aroma of God’s Love, which is perfumed with His Truth…………..
A real packaged and thoughtful message ,I enjoyed it. The theme you had ,Pastor Joe was maturing love produces confidence towards God , honesty toward others , joyful obedience ‘ . Your last point was also significant ,’ where he sits ‘. Overall a good agenda to base our spiritual lives on! Just what I needed to read this morning. Great message!